As those that follow us regularly know, we are big supporters of the BC SPCA and the work they do. We regularly feature pets waiting for adoption and often they are ones that are a bit harder to place. In today’s Foto Friday we are featuring a collage of pets that have been patiently waiting for some time in foster for their forever home. We have learnt that the Vancouver BC SPCA currently has a record number of canines in foster care. Since they are not in the shelter, they are not as visible to those looking for a pet, but of course just as deserving of that forever home. As of today’s writing, each of one of the dogs pictured is still waiting. So today we’d like to give them some virtual love to help them find what they so need and deserve. 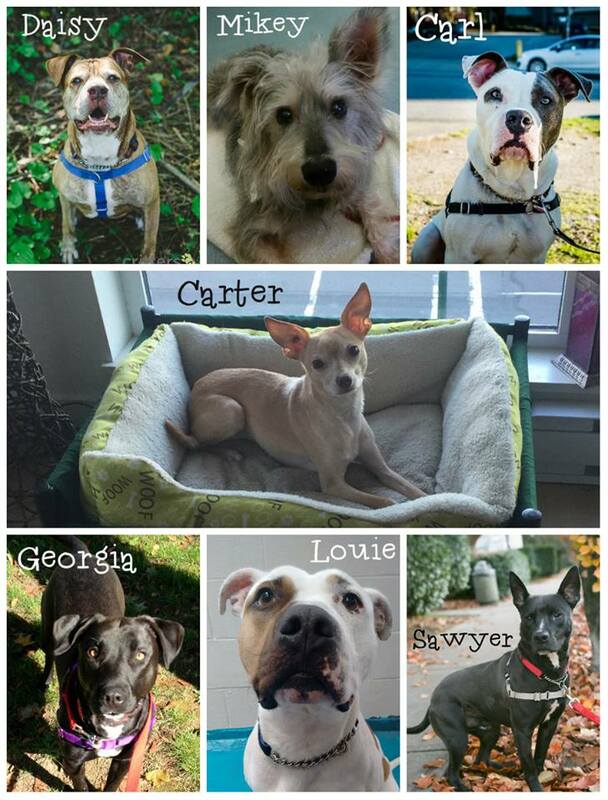 If you would like more information about any one of these dogs, you can find more information on their website at Vancouver BC SPCA, 1205 East 7th Avenue. You can also reach them by telephone at 604-879-7721 or by email at vancouver@spca.bc.ca. They will be more than happy to arrange a visit for you. As always, we welcome any shares. Welcome to the next installment of Rescue Me in which we feature pets waiting for adoption at the Vancouver SPCA. Today we would like to introduce you to a couple of animals in foster care. First off, there is Georgia who is a 2 year old Labrador Retriever crossed with Pit Bull Terrier. Georgia is a sweet, smart and energetic girl. She loves playing with other dogs and could easily live with a canine companion that has her rough and tumble style of play, but cats likely not. She’s a little too into them. Georgia’s friends at the Vancouver SPCA think she is best suited for a house with a yard as well as an adult only home. Ideally, Georgia needs people that will give her a fair bit of time and attention and initially shouldn’t be left home alone for more than 3-4 hours. This lovely girl recently tore her ACL and has had surgery to repair it, so needs a home with some TLC. 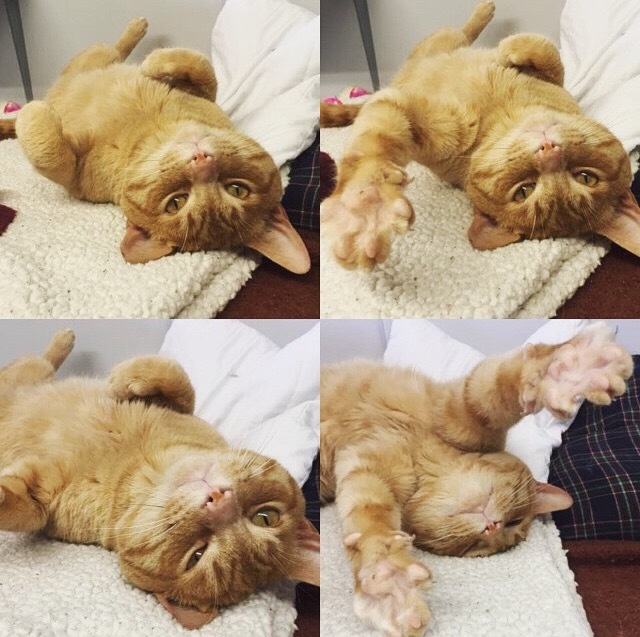 If you think you could give this fire ball of energy a forever home and some time to recuperate, the Vancouver SPCA Shelter would love to hear from you. You can find them at 1205 East 7th Avenue or by telephone at 604-879-7721 or by email at vancouver@spca.bc.ca. Next up, we’d like to introduce you to Ninja. Ninja is a 7 year old black short hair cross cat and her friends at the Vancouver SPCA would REALLY like you to meet this lovely girl. She is a favourite of the staff and volunteers at the SPCA. This girl has a heart of gold and an over the top affectionate nature. They’d really like to see her find her forever home. As she’s an older black cat, she tends to be easily overlooked. This lovely girl was surrendered when her guardian could not find pet friendly housing. This home was already her second home, so her friends at the Vancouver SPCA are really hoping her next home will be her last. There are few things that Ninja loves more than people and water. She’s often found pawing in her water bowls and keeping people entertained with her antics. We hear that she takes breaks from her water pawing to enjoy a major cuddle session complete with head butts. One minor disclosure, the staff at the Vancouver SPCA have noticed that Ninja is not really into the other cats, they are recommending she be the only feline in the home. She’s lived solely indoors and they feel it should remain that way. Common in older cats, Ninja is in the early stages of renal disease so regular vet check-ups are important. Ninja has so much love to offer and she’d really love a forever home. If you think you could give this sweet girl a forever home, the Vancouver SPCA Shelter would love to hear from you. You can find them at 1205 East 7th Avenue or by telephone at 604-879-7721 or by email at vancouver@spca.bc.ca. Welcome to the next installment of Rescue Me in which we feature pets waiting for adoption at the Vancouver SPCA. Today we would like to introduce you to Karma. Karma is a 2 year old female Pit Bull Terrier Mastiff Cross. So yes, she’s a large breed dog. We hear this girl will definitely bring some good karma into your life. She is full of wags, kisses and generally just a big love. As she is young, this girl has some exuberant energy to burn, thus will need an active companion. We understand she has some enthusiastic behavior, but with some exercise and obedience work, her friends at the Vancouver SPCA think she will learn some proper manners quickly. Karma is a silly playful girl and happily amuses herself with squeaky toys, but ultimately she is happiest by your side. If you think you could give this girl a forever home, the Vancouver SPCA Shelter would love to hear from you. You can find them at 1205 East 7th Avenue or by telephone at 604-879-7721 or by email at vancouver@spca.bc.ca. As always, we welcome any shares to help find Karma her forever home. UPDATED December 15, 2015: Karma has found her forever home. Thanks for all the shares. The Firehall Arts Centre invites you to their new show Social Studies which begins November 21st. This is a heart warming comedy about a well intentioned family in Winnipeg that adopts a South Sudanese “Lost Boy”. The show takes some funny twists which highlights Canadian values as well as cultural differences. Social Studies also delves into family connections and examines issues of loss, expectations, and the desire to do good in the world. As the saying goes, the road is paved with the best of intentions. You will see first hand how caring and compassionate Canadians deal with their fears and feelings about people’s lives who are very different from their own. We invite you to check out this “engaging new comedy”. The show runs from November 21st to December 5th. Tickets are available online from $23 at Firehall Arts Centre.